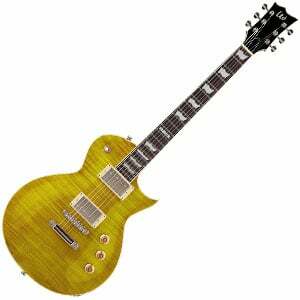 ESP LTD EC-256FM Review – Nothing Sour About This Lemon Drop! Let’s begin with the design, and it is pretty much full marks from ESP, who seem to have blended vintage Les Paul with a touch of metal attitude. Featuring that classic Les Paul single cutaway shape, the body of the EC-256FM is made with solid mahogany and a flamed maple top with the aforementioned Lemon Drop finish. It’s worth noting that the pictures and the actual product differ slightly – the finish is more golden amber in real life, instead of bright yellow. If this isn’t your cup of tea, both translucent black and ‘Cherry Sunburst’ versions are also available. With a beautiful high gloss finish and cream binding around the body and neck, all three choices are superb. Quality materials make up the neck of the EC-256FM, as ESP use solid mahogany capped with a rosewood fretboard. With a 24.75” scale length, this three-piece set neck is super slim with a fast-playing U shape, while the fretboard offers 22 extra jumbo frets for superior string bending. It really is a pleasure to play, and much lighter than you may expect – it’s almost Strat-like in its feel. We’re impressed when it comes to looking at, holding and playing the EC-256FM – so what does it offer in terms of hardware? As you’d expect with any Les Paul style guitar, there are two humbuckers at the bridge and neck positions, both ESP Designed LH-150s. These aren’t anything particularly special, but they do a good job for the price. These are tended to by a three-way pickup selector switch, an individual volume rotary control for each pickup, and a master tone control. The latter offers a coil-split via a push/pull mechanism, offering single-coil tone in addition to your humbuckers. There’s also good tuning stability with a set of chrome die-cast tuners on the headstock and a tune-o-matic bridge. This is a workhorse of a guitar in the tonal department too – a jack of all trades (in a good way). The high output means heavy rock is no problem, although they aren’t too modern that you can’t find a beautiful vintage blues tone with lengthy sustain. When the coils are split, you also get a bright and mix-cutting Strat style tone for great versatility. It’s genuinely hard to find a fault with the EC-256FM – in fact, we forgot it was a sub-$500 guitar. For the price, the fit and finish, the tone and the gorgeous looks impress, but the playability is the highlight. If you’re looking for an affordable stage friend, this mid-range performer is well worth adding to the shortlist. For more info about the ESP LTD EC-256FM, click here.